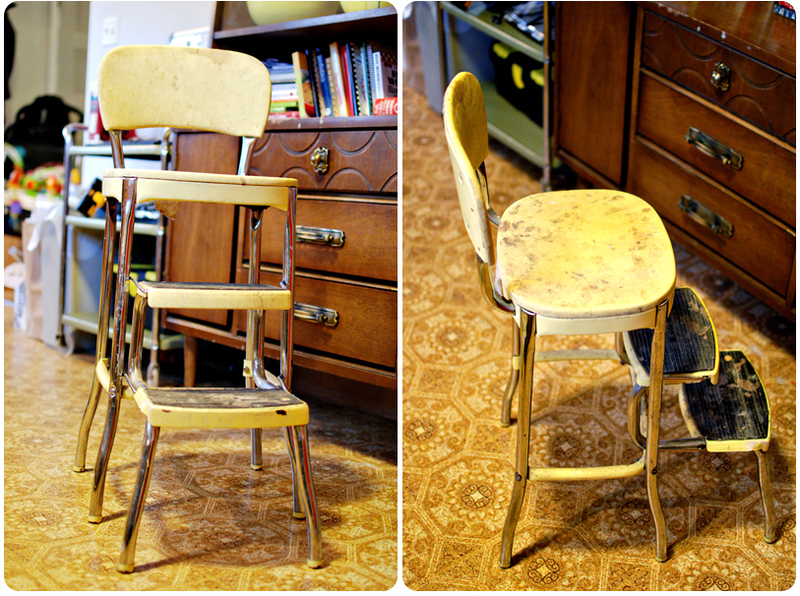 I picked up this vintage Stylaire kitchen stool at an estate sale a little while back. I’d been looking for one for a while, because I fondly remember the one my Maw Maw had in her kitchen, and was pleased as punch to find this one for $10. These suckers go from $50 to $300 on Ebay! When I was thinking about how I wanted to change it up, I really liked the yellow and thought I would keep it yellow. As for the seat I knew exactly what I wanted. Fabric Depot (local fabric superstore of awesomeness) has a great selection of oilcloth and there was one in particular that always caught my eye when I was there. I picked up half a yard during one of their super awesome weekend sales for around $6. For the yellow, I just went to Home Depot and picked up a bright yellow spray paint in a glossy finish. In order to paint the yellow parts I had to disassemble it. For the most part it was easy, with the exception of a couple of stuck screws that required a lot of WD40 and one that Rob had to use a vice grip to get out. I labeled all the parts as I took them off and taped off the chrome edges. To paint I had to wait for a dry day, which those have been really hard to come by lately. 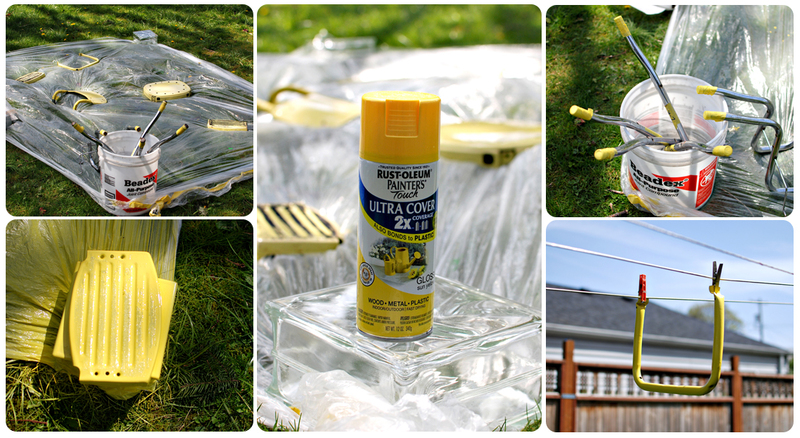 There was finally a dry day and I hauled everything out to backyard, laid it out on a plastic sheet and started spraying. I quickly realized that having the pieces laid directly on the plastic was not a good idea, and I grabbed some glass blocks that were getting thrown out to prop the pieces up. I was able to give everything a pretty good coating before Max woke up, but they still needed another coat. Then, it rained. And rained and rained and rained. I had to wait two mother lovin’ weeks to get back this thing. I put on a second coat and finished out the can. The next step was to recover the seat. 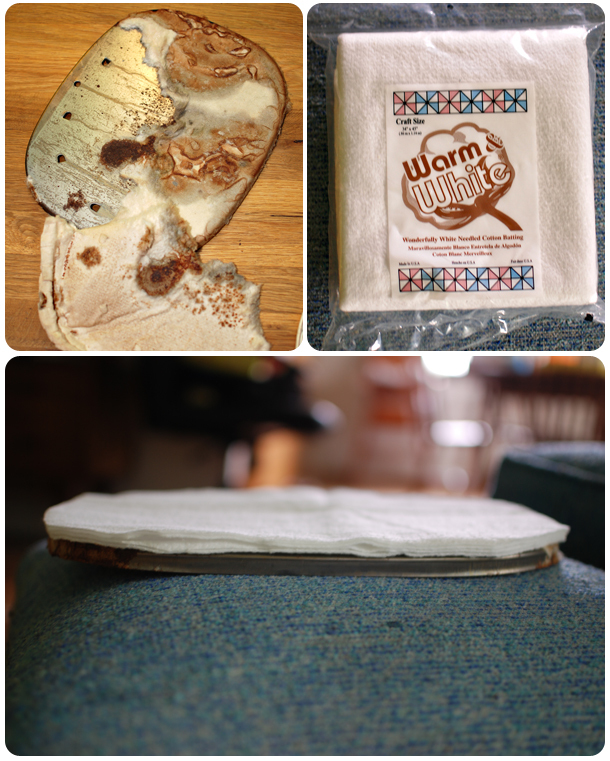 Now, I’ve never reupholstered anything before so I wasn’t too sure how I was going to go about doing it. The padding on the seat back was still in pretty good condition so I left it on there. I just cut out a piece of oilcloth about two inches larger than the seat back, then wondered how I was going to attach it. I decided duct tape was the answer. Glue wouldn’t dry fast enough and wouldn’t give me the option to change positions, so duct tape it was. The seat back went fairly quickly. The seat itself, not so much. 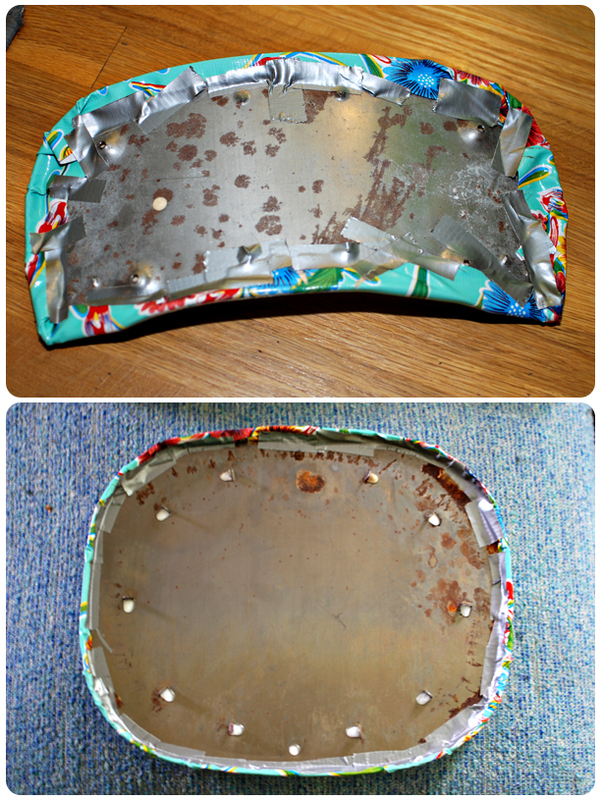 The padding was destroyed and needed to be replaced. I got some really thin batting from the craft store and cut it down to size. 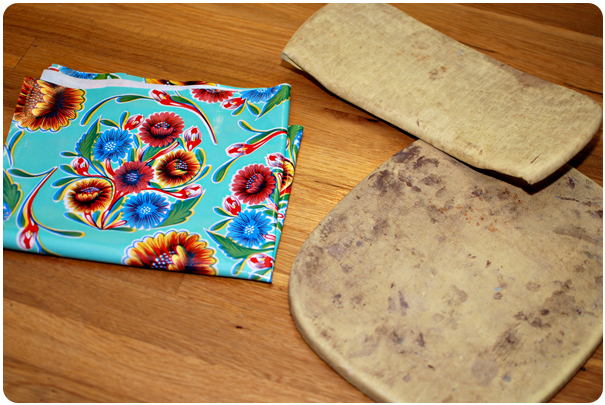 Then I cut out the oilcloth and got to taping. Looks really professional, huh? I should get paid to do this. Finally I was done and was able to put it back together. And since I had labeled all the parts and separated all the screws, it was pretty easy. Voila! I’m super happy with the way it came out! It was a fairly easy little project, and I’m sure it would’ve been done a lot faster if the weather would’ve cooperated. This was my first time spray painting and upholstering anything. I learned that there is a technique to spray painting and I don’t yet know what that is. Before I use spray paint again I’m going to do some research on how to avoid things like drips. As for the upholstering, I’m not sure I really had any other choice than to duct tape this. My next upholstering project will be done by the book, whatever that book is. Erin: I really enjoyed this post because it brought me WAAAY back in time to when I was a little boy( I’m 58 now) and I used to hang out with my Grandmere down in the bayou country in Golden Meadow, LA. 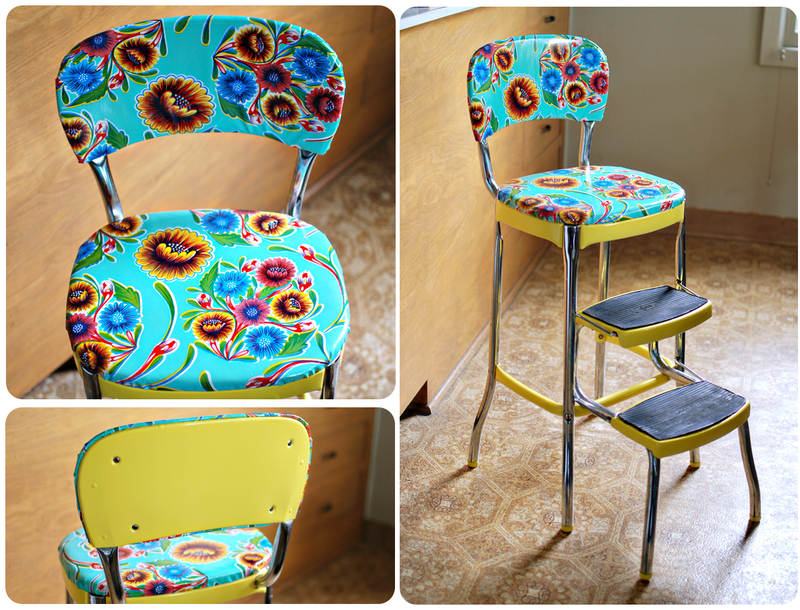 She had one exactly like this stool (also yellow) that I used to climb the steps and sit on and just talk to her while she cooked. She’s the one who taught me the little Cajun french that I know, and this just brought great memories flooding back to me. Thanks, and I can’t wait for you to bring Rob and Maxwell down to New Orleans. Old chrome usually isn’t very cooperative since the chrome itself is usually damaged after so long… I’ve heard of people using the rinse stuff you put in dishwashers on old chrome faucets and fixtures to remove spots. I am soooooo inspired by your post. 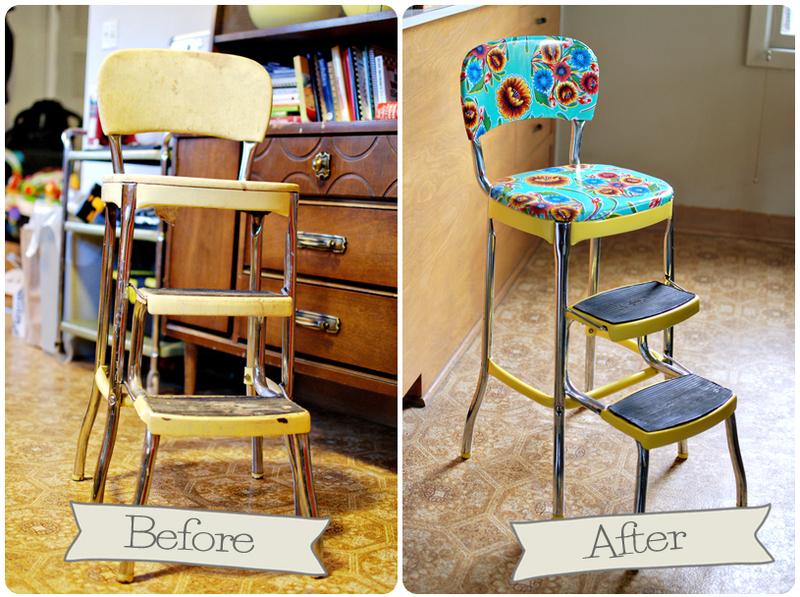 I got this same exact yellow kitchen stool (for free!) a few weeks ago. It’s in terrible shape and I started to believe there was no hope for it. You’ve COMPLETELY restored my faith. 1 – Was any of the metal rusty? If so, how did you deal with that? 2 – How on earth did you clean up those black mats for the steps? I scrubbed and scrubbed… and scrubbed mine, but the pent up paint and dirt isn’t budging! Yay! Mine had no rust, thankfully, but there are still some weird white-ish stains on the legs that NOTHING will take off. The black mats on my stool also had paint and crap all over them. In the end what worked was Goo Gone and steel wool. Then they were like new! Good luck with your stool, I look forward to seeing what you do with it! Hi all, Erin, you did an amazing job. I love that you thought to upholster it. LoriAnne and Katie, To get rid of rusty chrome, rub it with aluminum foil. It won’t scratch the finish and will take the rust right off. It’s amazing.